"Strictly Form exceeded my expectations in achieving my personal fitness goals...I strongly recommend them for anyone at any level of fitness." We understand that you're busy—that's why we offer private and semi-private personal training Monday through Saturady. To book a training session or inquire about availability, give us a call at (775) 826-3211 or send us an email at service@strictlyform.com. Ask about available group sessions. Take a look at our rates. We offer extremely competetive prices, six days a week! We are locoated just west of S. Virginia St. and Longley Ln. Please contact us with any questions or comments. We would love to hear from you! 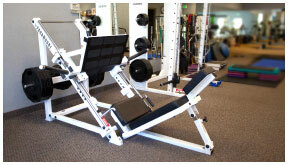 Strictly Form Uses Industry Standard Equipment.